One either loves them or hates them. I am a lover. I know those who don’t like them, and not for allergy reasons. Perhaps they had a bad experience in their youth, I can relate as I have not put a Brussels sprout in my mouth since I was about 8/9 years old. I know I find that hard to believe too, but I just can’t bring myself to it. I know its cabbage and I eat cabbage, lettuce no problem, but in my mind brussels sprouts are evil. I have not gotten past it and still believe I can live a full life without them. Mushrooms contain a lot of water. Because of that, you will see or hear recommendations to not clean your mushrooms with water. This is because they will soak up additional water like a sponge, taking longer to cook or preventing the mushroom from absorbing the intended flavor. I don’t know about you, I understand why, but I still have to put it under water for a second while rubbing it to feel it is clean. This has not once hindered my dish. I just be sure to do this in advance and dry with paper towels and let sit at least 30 minutes before using to draw out extra water. Another question comes in when cleaning – steams or no steams. Aside from taking off the rough bottom part of the stem, it is all a matter of preference. I use the stems, unless I am stuffing them. If that is the case, I chop up the stems and add them to the stuffing. I recommend purchasing whole mushrooms, as any pre-prepped produce will be more prone to spoiling, browning and just turning bad. The exception is if you can find a batch that looks fresh and you are using that day or at latest the following day, then go ahead. This will save time in prep, and that is important for week-night dinners. I would love to say my cupboards are bare of any canned produce. That would be untrue. I do have a couple of cans of sliced mushrooms and the higher quality of dried mushrooms. 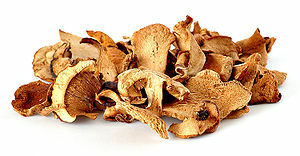 The dried mushrooms, no one is going to snub you, because purchasing certain exotic varieties are very expensive. You are better off getting the dried package and re-constituting (soaking in water). Never through out that water, it can add much flavor to broth, sauces, etc.. So why do I have canned mushrooms? Well – they are good in a pinch, but more importantly they are a key ingredient in Hot and Sour soup which I LOOOOOOVE. So I keep them and bamboo shoots handy. Back to preparing fresh mushrooms. You will determine how you want to use them. As I have said in previous posts, I love anything roasted. When roasting tomatoes, squash, etc,. I will toss some fresh mushrooms with olive oil, salt, pepper and oregano and roast. You can turn this into a puree on its own and use as a “pate” spread, or slice and add to any sauce, casserole, dip, etc. I a medium saute pan, heat oil on med-high until oil starts to shimmer. Add mushrooms and sear on one side for about 30 seconds, flip and repeat for the other side. Reduce heat, add a pinch of salt (will draw out more moisture, you can omit) and pepper. Add onions at the same time you add the mushrooms. Your cooking time will increase due to volume and additional liquid release from the onions. Add butter and garlic to a saute pan. Head over med-high heat. Once the foam from the butter subsides, add herbs, pepper and mushrooms. If too hot, reduce heat slightly and stir often. You don’t want the mushrooms or garlic to brown or burn. After about 3 minutes, add the wine and a pinch of salt. Increase heat to med-high (if not already there). The addition of salt in this step will release moisture from the mushrooms that will help to flavor the sauce. If you add salt in step 1, the moisture will evaporate. Let all simmer for another 3 – 4 minutes, tasting the mushrooms and broth and adjusting if necessary. Serve as a appetizer, side dish, tossed with pasta, on bread, or as a classic steak house steak topping. In general – if you are going to make up a batch, double or triple them as you can store them in the fridge for the week and your options are endless. They can be applied similar to my Caramelized Onions post. Another note – you can use vegetable broth or oil in lieu of butter to make this a vegan dish. Posted by culinaryease on December 16, 2010 in Cooking for two or less, General Cooking, Parties, Appetizers, and More, Recipes, Vegan/Vegetarian and tagged Caramelization, Garlic, Mushroom.